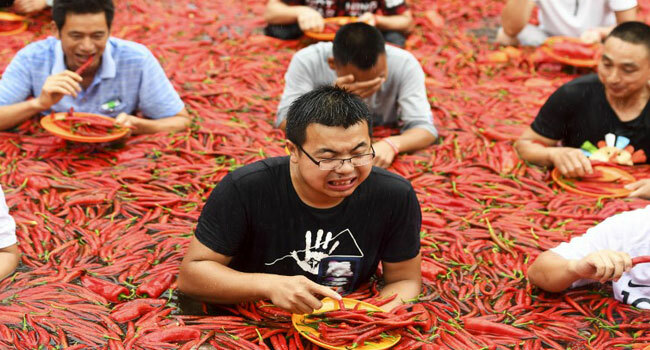 An annual chilli pepper festival kicked off on Monday in central China’s spice-loving Hunan province with a chilli-eating contest in which the winner set a blistering pace by downing a gut-busting 50 peppers in just over a minute. Local boy Tang Shuaihui took home a 3-gramme 24-karat gold coin for winning the competition, which is put on by a local theme park in the county of Ningxiang and is now in its second year. With doctors on hand just in case, ten contestants each held plates heaped with 50 Tabasco chilli peppers, racing to be the first to finish off the red-hot fruits. Tang cleared his plate in just 68 seconds in a contest held in nearly sweltering temperatures and as competitors sat in a shallow pool filled with water and three tonnes of floating chillies. “He finished them at an amazing speed, barely after the emcee had finished speaking,” said Sun Minying, an employee at the theme park, called the Tanhe Ancient City. The Tabasco pepper has a rank of 30,000-50,000 on the Scoville Heat Scale that measures the piquancy of chillies, which puts it somewhere between a jalapeno and a habanero. The peppers bobbing in the pool, however, were of a far weaker variety, partly to avoid irritating the contestants’ skin. 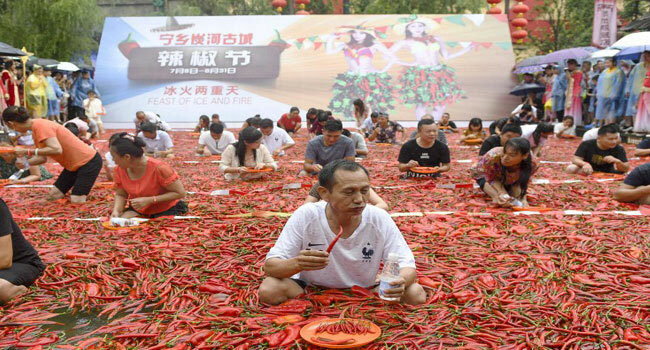 Smiling contestants wearing shorts and T-shirts — some armed with small bottles of water — waded into a vast pool of bright red peppers before attempting to clear their plates of chillies. One man floated on his back in the pool of chillies, chomping happily on the fiery fruits. Hunan cuisine is marked by its spicy peppers and richly coloured dishes and is considered among China’s eight great food traditions along with Sichuan, Cantonese and other cuisines. The festival lasts until the end of August, with a fresh chilli-eating contest held daily.